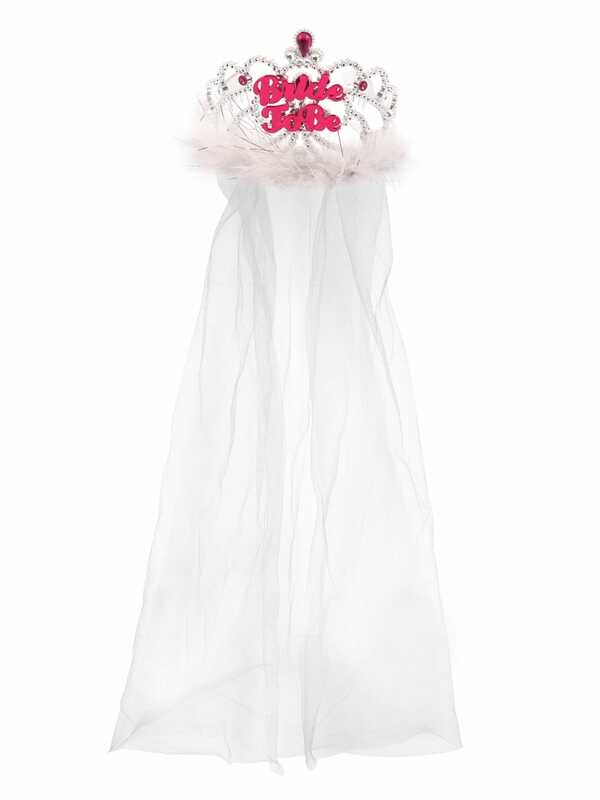 You'll look like royalty on your big night out in this pretty Bride To Be Tiara With White Veil . Let everyone know who's marriage you are celebrating and look fabulous doing it! This wonderful tiara has a silver diamante-style frame with pink gems at the centre. The words 'Bride To Be' are written in a bold pink font so there's no mistaking who's special night it is. The tiara is trimmed with white marabou feathers and silver flecks of tinsel and has a white veil attached to it. Showing our 7 Bride To Be Tiara With White Veil reviews with an average rating of Very Good. Would you like to write a review? Arrived on time, good quality for the price, very pleased. We were going to make a veil but at this price it wasn't worth it. Excellent value. Great customer service. Overall it was a good product. The 'bride to be' writing could be a little more clear as it is all in bold and quite close together. Also the 'to be' part came off when the bride was trying to position it right on her head, even though she was very gentle with it. perfect tiara for hen do, the bride to be was very happy with this purchase. only thing I would say was the veil was creased on arrival and trying to get the creases out were impossible, so when worn not only was it creased it didn't sit appropriately over the head. Good value for money! Lasted two nights out in Cardiff! Review - The tiara is OK but looks a bit more like one for kids. But it does the job to be honest. Otherwise I really think the veil is not really nice it looks more like a mosquito net. But all in all I think for the price is a good item. The tiara is OK but looks a bit more like one for kids. But it does the job to be honest. Otherwise I really think the veil is not really nice it looks more like a mosquito net. But all in all I think for the price is a good item.